New York State has long favored the establishment of free public libraries and, historically, it encouraged municipalities to establish them. In the past few years, however, the Regents Commission on Library Service and the New York State Library’s Division of Library Development (DLD) have promoted the rechartering of local libraries from municipal and association control to autonomous public library districts. Recent data confirms the wisdom of this advice: anecdotal evidence from libraries which use the public district model shows that public libraries enjoy fiscal and governance benefits from doing so. Moreover, the great majority of libraries that seek to recharter succeed in doing so. This article outlines the benefits of library rechartering, the options available to libraries interested in rechartering, and the rechartering process. New York State recognizes four types of local libraries: association libraries, municipal public libraries, school district public libraries, and special district public libraries. All four types of libraries exist as educational corporations chartered by the Regents of the University of the State of New York, but only the latter three are technically “public” libraries under state law. The autonomous public library district model recommended by the Regents includes both “school district” and “special district” public libraries, which share substantially similar-features. Of New York’s roughly 750 libraries, 129 have been chartered as school district public libraries, 27 have been chartered as special district public libraries, and 217 exist as municipal public libraries. The balance have taken a “nonpublic” form. Understanding why rechartering can benefit a library requires a general understanding of how the four types of libraries differ from each other. The most obvious differences are with respect to governance and funding, and not surprisingly, these are the two reasons for rechartering most commonly cited by libraries. Governance refers to how the library’s board of trustees or directors is chosen. Generally speaking, municipal and association libraries have trustees/directors who are appointed or selected by the library’s members or a governmental body. School district and special district libraries, on the other hand, are governed by trustees/directors who are elected directly by the voters in the library’s service area. Thus, the trustees/directors of school district and special district libraries are elected public officials and are generally regarded as more “democratically” responsive to the public. The Regents, DLD, and others favor the school and special district forms of organization for this reason. The other common reason cited by libraries for rechartering is to change the library’s core source of funding. In general, a municipal library relies on the municipality (or other governmental bodies) to fund its operations. Funding instability arises, however, when the municipality must balance the library’s need for funding against other competing municipal expenditures. In contrast, school district and special district libraries request funding directly for the voters, obtaining their funding through a direct levy on the tax bill of district residents. In the case of a school district library, the library tax levy must be approved by the voters of the school district in which the library exists. The tax appears as a separate line of the annual school tax bill, is collected by the school district’s tax collector on behalf of the library, and is paid over to the library upon collection. Under the special district library model, the budget and levy are approved by the voters of the library district, the library tax levy appears on the municipal/county tax bill, and the library itself is usually responsible for ensuring collection through a tax-collecting municipality. Until recently, association libraries primarily obtained funds through appropriations from governmental entities, but they are increasingly making use of tax levies collected through school districts to gain fiscal stability similar to school district libraries. The Regents and DLD favor the enhancement of fiscal stability of local libraries through the use of tax-levy supported funding. Moreover, experience has disproved the common misapprehension that libraries which need voter approval for funding increases will have difficulty obtaining approval because such increases directly affect voter tax bills. Library directors report that they rarely, if ever, have budget votes fail and that, as a general rule, rechartering has brought additional funding and an increased budget. CHARTER Regents incorporate by charter. Regents incorporate by charter. Regents incorporate by charter. Regents incorporate by charter. REGISTRATION Education Department registers. Must meet minimum standards in order to receive public funds. Education Department registers. Must meet minimum standards in order to receive public funds. Education Department registers. Must meet minimum standards in order to receive public funds. Education Department registers. Must meet minimum standards in order to receive public funds. TAX FUNDS May receive appropriation from units of government. Also tax levy by vote of municipal or school district voters. Library should sign contract with appropriating unit. May petition municipal and/or school district tax payers for funds. Budget approved by county, city, town, or village board. Also tax levy by vote of municipal or school district voters. May petition municipal and/or school district tax payers for funds. Budget approved by school district voters. May also petition for a tax levy from municipalities. Budget approved by district voters. May also petition for a tax levy from municipalities, unless enactment legislation specifies otherwise. BOARD OF TRUSTEES Number: 5-25. Elected by association members. Term of office: set by charter. Responsible to association membership and to Regents. Residential requirements may be established in bylaws. Number: 5-15. Approved by municipal governing board; term of office: three or five years if established after 1921. ** Responsible to municipal government, public, and Regents. Must be residents of municipality (except village library). Number: 5-15. Elected by school district voters. Term of office: three or five years (if established after 1921). ** Responsible to school district voters and Regents. Must be residents of school district. Number: determined by enabling legislation. Elected by residents of special district. Term of office: five years or as defined by legislation. Responsible to special district voters and Regents. Residency requirements determined by enabling legislation. COMMUNITY INVOLVEMENT Public can join association and may vote for trustees. Public "owns" library; votes for elected officials who are sympathetic to library needs. Public "owns" library and votes directly for trustees and budget. Public "owns" library and votes directly for trustees and budget. RETIREMENT BENEFITS May purchase retirement benefits from private vendor. Some may be in State Retirement System if specified in statute. State Retirement System benefits through municipality. State Retirement System benefits through school district or independently. State Retirement System benefits if library district opts to participate. CIVIL SERVICE Employees not covered by Civil Service. Employees subject to Civil Service Law. Employees subject to Civil Service Law. Employees subject to Civil Service Law. * Special library districts are created by act of the New York State Legislature. Each one is different and reflects the particular needs and situation of that district. There is no comprehensive legal definition of a special library district. ** Became effective January 1, 1999. The Rechartering Options - - Which Type is Best for Your Library? Obviously, the choice of structure for any library should be driven by the needs and circumstances of that library. As noted above, the Regents, DLD, and many successfully rechartered libraries recommend school district and special district libraries because of the increased responsiveness of elected trustees/directors and improved funding stability associated with these models. However, each of the library models also has limitations which may make it unsuitable for a particular situation. For example, although the association library model offers flexibility with respect to service area (the library’s geographic service area is not strictly limited to that of a municipal or school district boundary), when voters are asked to approve a tax levy to support an association library, they may balk because the levy is not accompanied by the representation which comes from direct election of trustees. In addition, in the event that an association library wishes to issue bonds for a capital project, such as construction of a new branch, it cannot do so except through the Dormitory Authority of the State of New York and then only through a special act of the Legislature. Conversely, school district public libraries enjoy the benefits of directly elected trustees and stable funding through a tax levy, but they are limited in geographic reach to the school district in which they are situated – they cannot, for example, add a branch in an area which is not served by the school district with which they are associated. Likewise, school district libraries are constrained in their ability to issue debt, because they must work through the school district when the need arises to issue bonds. Still more limited, municipal libraries face the dual difficulty of having neither publicly-elected trustees (since their trustees typically are appointed by the governing body of the municipality) nor a guaranteed stream of funding (since their funding is at the whim of the governmental entity’s fiscal process rather than supported by a dedicated tax), and their service area is generally limited to the geographic area of the municipality with which they are associated. They do, however, have the benefit of reasonably easy access to bonding for capital projects through their municipality. Lastly, special district libraries enjoy the benefits of directly elected trustees and stable funding through a tax levy and, unlike school district and municipal public libraries, they are not limited geographically. For this reason, special district libraries are often the choice where a library will serve multiple school districts or municipalities. Special district libraries, however, are cumbersome to create because they require both voter approval and a special act of the state Legislature and, consequently, the support of the local Senate and Assembly members. Moreover, the enabling legislation itself can be limiting if not properly designed. Care must be taken to ensure the library is given broad enough powers (i.e., to levy taxes and obtain bond financing from municipalities) to function effectively. In short, no public library model is ideal for every circumstance. The choice of library structure should be based on the needs and priorities of a library and its users. Once a library has made a decision to recharter, the process must be planned for and managed carefully. The rechartering process is governed by strict, but not always clear, statutes and is also affected by the statutes and rules governing the entity with which the library intends to associate. The basic outline of the rechartering process is set forth in Education Law § 255. That statute sets forth the necessary vote, the mechanisms for transferring or acquiring property, the petitioning process (voters’ signatures are typically required), the necessary public notices, and other elements of the establishment process. Education Law § 259 directs the mechanisms to be used to seek voter approval for a tax levy and the approval of the library’s budget. Education Law § 260 establishes the requirements for the election of trustees, their mandatory eligibility and residence criteria, and the conduct of board meetings, and Education Law § 261 requires that, within a month of taking office, the new trustees/directors of a rechartered library file an application for a charter with DLD. With respect to these statutes and the generalities of the rechartering process, the staff at DLD are extremely valuable resources. Any library considering rechartering should call their DLD representative as a first step in the process. While the basics of the rechartering process are set forth in the statutes described above, the process very quickly becomes complicated by the interaction of the library statutes with the statutes and rules governing school district and municipal meetings and elections. Moreover, libraries should be aware that the rechartering process is not always met with enthusiasm by governmental units which may see a separate library, with the power to levy taxes, as competition for finite tax-payer support. On this basis, libraries are well-advised to engage an experienced attorney who is familiar with the nuances of education and election law to help design and implement a sound rechartering plan that anticipates speed bumps and road-blocks along the path to success. Library Board should begin to determine which model to follow. Hire counsel to research and develop an organizational plan and rechartering proposal to be presented local leaders. Contact DLD for assistance and advice. Meet with local leaders to present rechartering plan and negotiate terms of transfer of assets if necessary. Continue discussions with DLD to review process and procedure for rechartering. Secure cooperation and approvals of plan from local leaders. Execute memorandum of agreement containing material terms of the process. Publish notices seeking trustee candidates and begin public outreach campaign. Develop budget for new library and finalize tax levy proposal. Estimated deadline to draft and publish resolutions for establishment, budget, tax levy, and trustee elections on ballot for May consideration during School District meeting. Revise bylaws for passage at new library’s organizational meeting; obtain pre-approval from DLD if possible. Obtain DLD forms for charter submission and confirm all aspects of DLD requirements are in place. Place school district library establishment resolution, budget, and trustees up for vote at annual School District election. Upon passage, and at final meeting of "former" APL trustees, transfer assets of "former" APL to newly formed school district library consistent with Educ. Law § 266 (may need to hold off on transfer until receipt of charter from Regents). Attorney to submit charter application to DLD. System or library informs DLD of pending action. Library Board meets with School District. Library Board meets to discuss wording of petition, number of signatures needed, timeframe, budget and trustee slate. Petition submitted to school district in a timely manner. School District sends out notices. Library Board holds many community meetings to discuss and defend proposition and budget. Process continues until last vote is cast. Thank you's are sent out to public and volunteers. The benefits to a library which chooses the best model for its circumstances are significant. In addition to offering greater political clout, increased public support, and heightened financial stability, rechartering can hold the promise of an organizational structure designed by the library to be suited to its goals and responsive to its opportunities for success. While the decisions of whether to recharter and which form to choose are technical, and the process of rechartering can be complicated and difficult, successful rechartering may be the best way to ensure not only a library’s survival, but its role as its community’s educational and cultural treasure chest for the future. †The authors are attorneys with the law firm of Whiteman Osterman & Hanna LLP in Albany, New York. Both are members of the firm’s litigation and labor and employment practice groups. Ellen Bach is a member of the Board of Trustees of the Albany Public Library and chaired the Committee that successfully sought to recharter that library in 2002. Robert Schofield provided legal counsel to the Albany Public Library during its rechartering process and now works with the Library on day-to-day legal issues. Andersen, Deborah L., Rechartering Libraries: A Survey of NYS School District Public Libraries (2002). The results of Professor Andersen’s study form the basis of her article “Selling a Public Good: The Case of Rechartering Public Libraries by Referendum in New York State” which is forthcoming in Public Library Quarterly Vol. 21, Issue 4 or Vol. 22, Issue 1 (2003). An association library is established by a group of private individuals to serve “all the people in the community in which the library is located,” Education Law § 253 (2), whereas a “public” library is established by a village, town, city, county, school district, or special state legislation. Education Law § 255 (1). Called school district libraries because their geographic service area is contiguous with that of the school district in which they are located, these libraries are otherwise separate and distinct entities from the school district with their own trustees, own budget, and typically, their own tax levy. While all New York libraries are educational corporations under the supervision of the Regents, the formation of certain libraries predated the current Education Law and, therefore, these libraries are chartered by acts of the Legislature. These libraries function as hybrid entities sharing organizational characteristics with both association and municipal libraries. New York also recognizes public library systems which are formed by two or more public libraries working in concert to broaden service in their geographic service areas. For more information on the formation of library systems, see Types of Library Systems -- A Comparison. Currently, there are 23 public library systems functioning within New York State. Source: National Center for Education Statistics; Library Statistics Program; Public Library Locator. Andersen, Deborah L., Rechartering Libraries: A Survey of NYS School District Public Libraries, at pg. 8. This survey shows that “democracy” and “funding” are often the two most important factors in a rechartering decision and that the “short-term” and “long-term” effects of rechartering tend to confirm the perceived benefits of rechartering. While municipal libraries can petition governmental entities for a tax levy, their rights in this regard are more limited than either the school district or association libraries which have the inherent authority to do so. Education Law § 259. Special districts typically are not allowed to petition other governmental entities for a levy unless their enacting legislation provides that authority. School Districts and Taxes For Public and Association Libraries: How the Partnership Works (2003). The primary reason for this position originates from Education Law § 259(i), which provides that a library tax levy is continuing in nature and recurs from year to year in the absence of a vote to increase or decrease it. Thus, once a library tax levy is established, even the failure of a proposal to increase the levy does not negatively impact the continuation of the levy unless the voters specifically vote to decrease it. Andersen, Deborah L., Rechartering Libraries: A Survey of NYS School District Public Libraries, at pg. 17. This table is also available at http://www.nysl.nysed.gov/libdev/libs/pltypes.htm. § 255 contains parallel provisions for the establishment of cooperative library systems, reference and research systems, and tribal libraries. The Regents of the University of the State of New York - - the oversight authority for all educational corporations in the State -- has developed a guidance document for trustees and board members of all education corporations, including public libraries. The document, entitled Statement on the Governance Role of a Trustee or Board Member, provides a comprehensive resource to library trustees who may want additional information regarding their roles and responsibilities. Another useful resource for trustees is the Handbook for Library Trustees of New York State – 2015 Edition. This guide is an excellent source of information needed by library trustees to carry out their responsibilities. For a comprehensive review of the statutes and case law affecting libraries in New York, consult Robert Allan Carter’s book Public Library Law in New York State (2002; revised 2006). In addition, excerpts of most statutes and regulations that affect public libraries in New York can be found on the Division of Library Development’s website at Excerpts from New York State Law and Regulations of the Commissioner of Education pertaining to Libraries, Library Systems, Trustees and Librarians. This chart is also available at http://www.nysl.nysed.gov/libdev/libs/pldtools/schdist.htm. 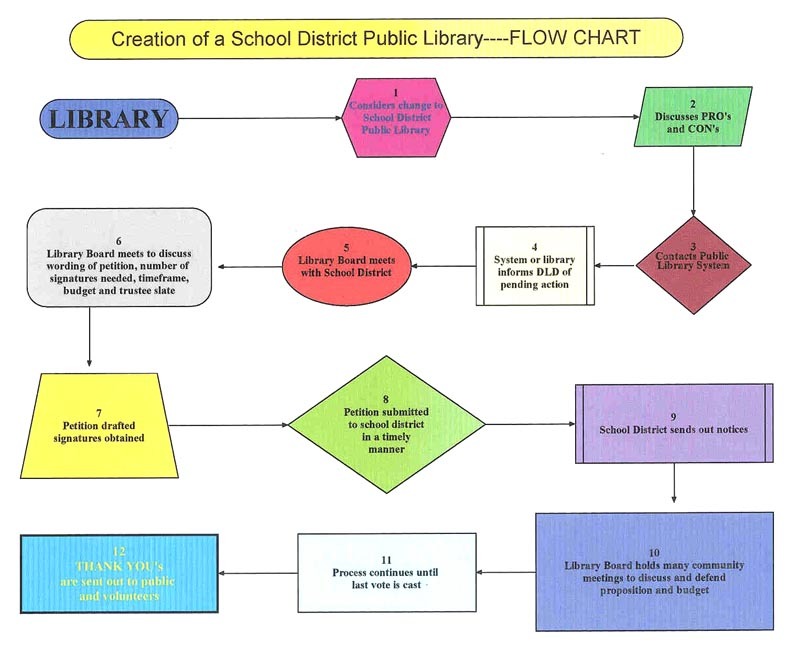 A chart listing the steps to establish a Special District Library is also available. This document originally appeared on the New York Library Association web site and is used here with permission.